SUMMARY: Background theory and implementation techniques to promote empowerment in the domestic dog. AUDIENCE: Specialist trainers with a solid scientific background and/or applied behaviourists/behaviouralists. REVIEW: I am quite conflicted about writing this review as I will not give it a lot of stars, yet I love what the author is about. His background research is gargantuan, and he displays an awe-inspiring grasp of the multi-disciplinarian science topics behind behaviouralism. 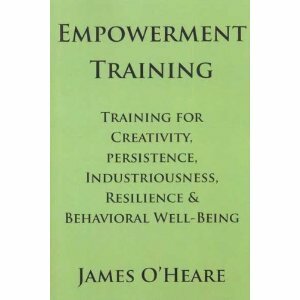 Throughout this book, O’Heare proposes that empowerment, to be promoted through creativity, persistence, industriousness and resilience, is a powerful tool to improve the quality of life of a reaction-depressed dog (in extreme cases, one displaying learnt helplessness). Whilst I love his academic tone (no assertion is left unreferenced, no new concept is left undefined), his thoroughness is perhaps also his downfall. Some chapters are thorough and exact to the point of tedium. Here is an example. Bearing in mind the likely reader (experienced trainers/behaviourists with a solid scientific background), attempting to explain shaping in its most minute details is impractical. The same can be said to the chapter on learning theory, although I can see that these are necessary to explain the parallels with strict behaviouralist terminology, which boils everything down to a technical contingency statement (discriminating stimulus, motivating operation, response, consequence) in the most elegant way. However the basics could be somewhat abridged, as one must assume that the readers are proficient in these concepts. I am reading a couple of his books at the same time, so I have noticed that the introductory chapter on theoretical orientation (wonderfully written, by the way) finds itself in more than one book. I can see that this is required, but it feels a little redundant if you read several of his books in a row. The theoretical orientation chapter defines different currents among pet behaviour specialists, including his own credo: behaviour analysis. He distinguishes behaviour analysis from the medical model (i.e. from Karen Overall and other diagnosis-based practitioners). He makes some very good points about the pitfalls of the medical model, such as the application of sometimes superstitious training techniques and the reliance on often outdated ethological principles, but he rejects it outright. I feel that a therapeutic model making use of diagnosis is extremely helpful, as long as the training techniques and their ethological foundation continued to be viewed and applied critically, and in light of the latest science. He also prefaces the book with the fact that this is a first draft. Unfortunately, it has that feel to it indeed. For example, I am concerned that creativity, persistence and industriousness have the potential to be expressed in inappropriate contexts, and are counterproductive to possible concurrent extinction projects. The idea of focusing on creativity, etc. to promote well-being is very intriguing, but I would need concrete recommendations about how to prevent their inappropriate generalisation. I am not sure whether the omission of a chapter addressing these concerns is just “first-draft syndrome”, or whether the original idea has not been thought through to its conclusion, with the necessary risk analysis in mind. Finally, tiny tiny tiny point: an index would be lovely. So, as I have a soft spot for him, all in all, I am glad I read the book. I am looking forward to a refined second or third edition, though. Browse the Book Review archive. Genre: professional manual. 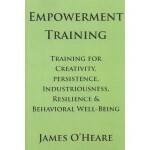 Author: O'Heare James. Reading Level: Academic, Professional. Star: 3. Bookmark the permalink. Post a comment or leave a trackback: Trackback URL.